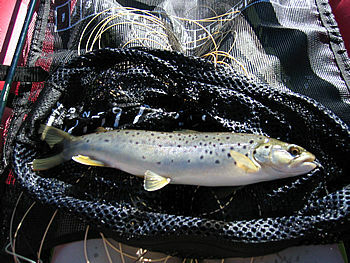 Except for my brief foray up to Alaska in April, I really haven't done much fishing this year. As a result, I was really looking forward to this double-header weekend. Kelly Bandlow and his partner in crime, Jimmy D – who you might recall from Kelly's colorful Feather River report last year – decided to fish Fuller Lake on Saturday and then join the Kistler Ranch Fishout on Sunday. I rode with Kelly in his car, which was packed to the roof with various fishing accouterments, the largest of which was Kelly's brand new Outcast PAC 9000 – a pontoon boat so sophisticated that Outcast lists it in their "Specialty Series." This was wedged on the back seat with my seemingly tiny Scadden kayak perched on top. Who needs the rearview mirror anyway? 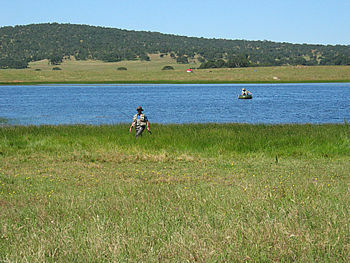 Fuller Lake is located just off Interstate 80 past Auburn, near Nevada City. Water from Fuller is dropped through a penstock into Spaulding Lake, a man made reservoir at 5000 ft on the South Fork of the Yuba. The primary inlet to the lake is an artificial canal, conducting water from Rucker Lake, just north of Fuller. Jimmy D also has one of these ultra-sleek, low profile Outcasts so he told Kelly that setting it up from scratch would be, "No problems at all." Of course, assembling one of these things is like putting together your kid's Christmas gift late at night. (And on many perverse dimensions, I could draw similarities between inflatable boats and children's toys. But I digress.) I worked on assembling and inflating my own kayak and the next time I looked up, Jimmy and Kelly were whacking the bottom of the pontoon seat with a large rock. Of course, I immediately saw the problem. Nobody uses rocks anymore; I helpfully suggested a stick. To make a long problem short, it took a good amount of time to completely put everything together, a process that actually required several cycles of disassembly and reassembly (but no dissembly) before we thought we had done it right. If it were mine, I would probably now take 5-minute epoxy and glue the entire structure solid. Kelly breaks (in) his new boat. Nevertheless, once in the water, it rowed like a dream – well, until a seat bolt fell off into the lake, but that's another story. The fishing started slow as we concentrated on the inlet canal. Underwhelmed, we all paddled off in our own directions. I later caught up to Kelly on the far side of the lake. Naturally, he was into fish – he always finds the fish. I figured that he had tried scores of flies until he found that the green sparkle wooly bugger did the trick. He later admitted that he overheard a conversation between two other pontoon anglers who were discussing the merits of said pattern. He even generously gave me one, which worked wonders once I tied it on my sink tip. Soon Jimmy rowed over and we spent the remainder of the evening on a fairly consistent drift parallel to the bank. We'd cast into the wind, let the fly sink deep, and slowly strip back. On many occasions, someone would shout, "Got one, nope, it's off." Only to have the fish come back and hammer the fly again. "Fish on!" We caught mostly beautiful browns, averaging 12 to 16 inches, and a handful of rainbows, most of which appeared to be hatchery rejects. Some of them were "very special" fish, which seemed to have developed flattened heads from hitting concrete walls their entire life. I've never understood the point of stocking these wretched creatures. At dusk we deflated the boats and ate dinner in Auburn. We had originally planned to stay in Oakdale so we could get an early start at Kistler. However, I had learned earlier that the 3rd week in May was the annual Oakdale Chocolate Festival (hurrah!) and every hotel in town was booked solid. As a result, we stayed at a place in Lodi selected at random, mainly because it was close to cheap gas. That's the way life goes. We were up at 6:30 AM, made pit stops at the gas station and McDonalds, and an hour later we were headed down Interstate 5. We got to Kistler at around 8:30 AM and to our amazement, nobody was there. Soon, however, Jim Buatti, Matt Rossi, Rich, George, JC, Bobbi, Mike, and Ed arrived. That's about when I lost track of who was there. Jim has a really sweet fishing craft, a Watermaster Raft, which appears to be one of the better hybrids between a float tube and a pontoon boat. The setup was hands-down the fastest, most convenient craft to rig and take down. By coincidence, Jim was up at Fuller Lake the previous day with his new craft doing a shakedown cruise. He drove all the way back to the Peninsula Saturday night and then out to Kistler on Sunday. 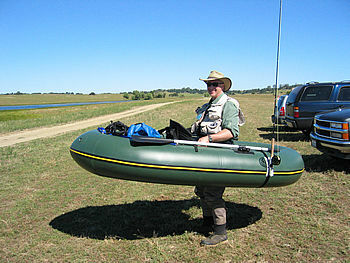 Jim headed to the main pond wearing his fashionable Watermaster. Kistler Ranch has three ponds. The main pond is quite large and features a small fleet of water craft (paddle boats and canoes), which customers can use. The two other ponds are smaller. According to George and Rich, the water levels were very high compared to previous years. Kelly, Jimmy D, George and I fished one of the smaller ponds. Being a newbie at bass and bluegill fishing, I figured that any fly that looked like a worm would be adequate, so I settled on an olive fur Zonker-like thing I had tied on the advice of Jimmy D. Of course, I had it completely wrong. After an hour flogging the water, I finally noticed all the damsel flies dancing around me. That's when I changed to a green damsel nymph. I cast towards the weeds and, whammo, a 10 inch bass inhaled it. My second cast resulted in a plump bluegill. Of course, by this time, I was getting cocky and, naturally, the fishing gods look askance on the overconfident. As quickly as it started, everything died. Before lunch I had maybe 4 more bass but it was hardly fast and furious. One inconvenience was the wind. 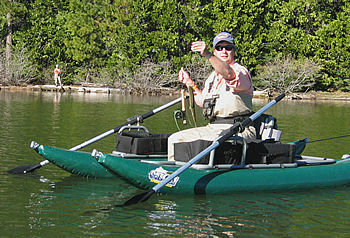 For the float tubers, the wind is not that much of a concern because they sit low in the water. However, in a pontoon boat, or, in my case, an inflatable kayak, wind is a real hassle. I did, however, try an experiment. I had brought a mesh laundry bag -- the type you would use for delicate items, if you had any. Instead of pantyhose, I filled it up with 5 lbs of rocks and ran a rope through the upper end. Voila, instant anchor. It saved me from being pinned by the gusts against the far bank for most of the day. After lunch, we returned to our boats and continued the hunt. In our smaller pond Jim had located a school of bluegill and was destroying them methodically on a nymph he called a Mackie Bug. It is a dubbed body with a wings and tail made out of rubber-leg material. The bluegills appear to be mesmerized by it – he pulled 7 gills out of one small hole in the weeds. I will definitely have a few with me the next time we fish Kistler. Gradually, the rest of the PFF'ers packed up and wandered back home. Kelly and I were the last to leave. I did a final sweep of the lunch area and found some left-over goodies, which I gave to the kids at Kistler. Otherwise all looked ship shape. Surprisingly, except for a small piece of congestion near Tracy, the traffic home was light and we were back by about 8:30 PM.